Intriguing map referencing the expansion of San Francisco. 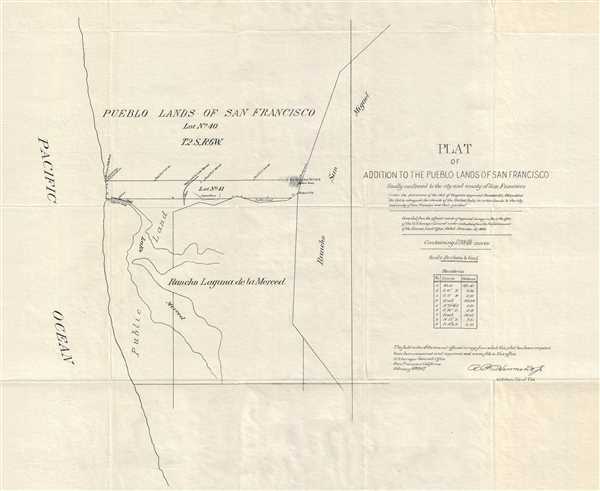 Plat of Addition to the Pueblo Lands of San Francisco finally confirmed to the city and county of San Francisco. This is an 1886 U.S. Surveyor General map of Pueblo lands granted to the city and county of San Francisco by the Federal Government. The map depicts the region from the Pacific Ocean to the Rancho San Miguel, focusing on Lake Merced and the Rancho Laguna de la Merced. The granted land dominates the top third of the map, with public land along the Pacific Coast to the west of Rancho Laguna de la Merced and the boundary between the Rancho Laguna de la Merced and Lot No. 41. Several posts are labeled along the boundaries of Lot No. 41, located above the Rancho Laguna de la Merced. A table detailing the distances along the left and lower boundaries of Lot No. 41 is situated on the right.